Twitter is a wonderful thing, only sometimes it leads to news that you have to sit on for a month and wait until said news can go public... well that time has finally come... look what's coming to the UK! I've been excited about these ever since I saw them featured on Endangered Trolls last year but unfortunately we weren't to see them debut in the UK as they remained exclusive to the Danish Market. No confirmed news on exactly what date these will be with the Story Retailers but I do have the info on the range of designs and what prices they will retail at in the UK. There will be a choice of 14 watch designs ranging from £59-£119 and in 4 different finishes, these are all high gloss polished steel, with genuine shards of mother-of-pearl and come with or without the bling of Swarovski Crystals! 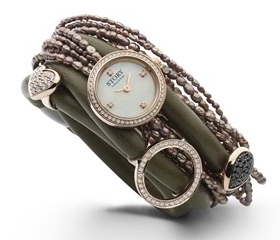 You wear them on your Story Bracelet as you would do any other charm, and voila you have a new watch every time! When my last watch gave up the ghost (matched beautifully with my Story Garnet String Bracelet in case you were curious) I decided I wasn't going to buy a new strap or new watch... I was going to save up for a Story Watch Charm instead. I've had to wait a wee bit longer than I thought, but it will be nice to be able to finally tell the time once more, without having to liberate my phone from my bag every time by just glancing at my suitably adorned wrist instead. The beauty of watch charms is you can change your bracelets, add other charms or wear it by itself, it's the ultimate modular watch! Right that's enough blathering on by me about why I'm so stoked they're coming to the UK... What *exactly* is coming? In the black finish you have 2 choices, the square "Roman" design which retails at £59 or the round "Simple" design which retails at £69, you can get both of these designs in all four finishes at exactly the same prices. In the rose gold coloured finish you can get an additional 2 designs, "Sparkle" and "Dark Sparkle" as well as Roman and Simple. Sparkle and Dark Sparkle are both priced at £119. In the silver coloured finish, you have a choice of Roman, Simple, Sparkle and Flower. All the Sparkle designs are priced at £119 whilst the Flower designs retail for £95. Finally you can get the same four designs in a gold coloured finish too. I don't think my thoughts have changed much since I first saw these; my favourites are still the black square Roman design and the round silver coloured Simple design, although I have to confess my eyes keep getting drawn to the rose gold coloured Dark Sparkle! Alas, that is above and beyond my current watch charm budget! I also wouldn't have anything else to go with it unless I were to pick up a few rose gold skulls... a'hem *must remember my Boiler Fund* and not get too carried away... for now! So my lovely readers, do you see anything you fancy? Have you worn watch charms before? Will you when they are available? I'd love to hear what you think! I'm blindly making the assumption (based on NO evidence, facts or indeed knowledge) that as our lovely UK retailers ship worldwide, that even if these aren't released elsewhere (but I also blindly assume they will based on just having a positive outlook on life and nothing else) that other folk will be able to buy these soon too - even if you don't live in Denmark or the UK! I think the Dark Sparkle will appeal to a few and I don't normally do rose gold; it's only because I've been looking at Rose Gold Skulls in Rebeligion that it's started me off! Wow what a diversity and they are beautiful... personally I'm a silver-lover and don't like to many decorations... so the simple watch looks perfect for people who think like me and you can create so many lovely things with it !!! Fabulous !!! I'm torn between that one and the black square face, I quite fancy the silver one to go with my black lambskin and the black to go with my green leather string one... this might only be resolved with a trip to a shop... if I can wait that long! Great news for the UK, these look really substantial watches that not only do the job but also make a big statement on your bracelet. Thanks for sharing Mars!! Thank you it's been my pleasure to share this today, have been counting down the days until I could publish the news! (I'm a bit excited about this as you might have guessed). Interesting news. Delightful concept. Choice Rose Dark Sparkle, matches the bronze X blet. However, the designs are all fascinating and anyone would be thrilled to have their wrist adorned with one - two - or more! Ooh that's a good idea, I find I'm really loving the bronze X bracelet at the moment, it's getting paired with everything I'm wearing at the moment. You've given me an idea, I think that would be a good bracelet to make sure I'm wearing when I go to have a look at these in person... Thanks! Great idea Tracy! I must admit I like watches that have all the numbers (or dots) marked out on them just 'cos I don't have to think so hard about telling the time #1stworldproblems or perhaps that's just my age now!! I've never heard of these before, but they look delightful! I'm looking for a new watch since I lost mine at work a few weeks ago!